Mountain View Cemetery is a large, incredibly beautiful cemetery at the end of Piedmont Ave. Many significant Oakland and California historical personages are buried or interred there. The grounds are popular with people jogging, walking their dogs, or just taking in the views. Its numerous winding lanes and lack of traffic have also made it a popular place to teach young people to drive. The 224-acre grounds include thousands of graves, several chapels, and a number of mausoleums. Cemetery Creek (called Glen Echo Creek further downstream) flows through it. Three reservoirs, created by damming this creek, provide water for the grounds for several months of the dry season, as well as habitat for waterfowl and other animals. Dr. de Tavel offered the Oakland City Council 10 acres of land for a cemetery on June 24, 1857. This proposed cemetery would have been located at the 'back of Mr. Fountain's" property on Peralta Road. W. H. Bovee also offered the Council 'Block Number 200.' The cemetery ordinance was passed by the Council on July 1, 1857, which accepted Dr. de Tavel's offer of 10 acres. That property was later acquired by Rev. Isaac H. Brayton and Edward Tompkins. Some of the concerns were that the Webster Street Cemetery was near full, no longer “out of town”, and blocking civic expansion. A long-term plan was needed. Meeting(s) at the home of Dr. Samuel Merritt to discuss the creation of Mountain View Cemetery included Richard RW Heath; Rev. Samuel Taggert Wells; Joseph Stickney Emery; Hiram Tubbs; Addison Crane; George E. Grant; Solomon E. Alden; Jeremiah Whichter; William Faulkner; Rev. Isaac Brayton; Gen. Ralph Kirkham, and Joseph Addison Mayhew. 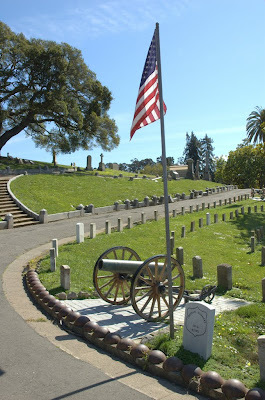 In December 1863, a group of influential Oaklanders formed the Mountain View Cemetery Association. The first Trustees were Dr. Samuel Merritt, Hiram Tubbs, George E. Grant, Addison M. Crane, Joseph Addison Mayhew, Rev. S. T. Wells, Solomon E. Alden, Rev. Isaac H. Brayton, Jeremiah E. Whitcher, R. W. Heath, William Faulkner, and Joseph Stickney Emery. Dr. Samuel Merritt was elected president of the Mountain View Cemetery Association; Hiram Tubbs elected Treasurer, and J. E. Whitcher was elected Secretary early in 1864. Mountain View Cemetery, Oakland (1889) 2The location of Mountain View Cemetery was selected on over 200 acres in a valley at the foothills outside of the city limits, one and a half miles east of Oakland. Bonds were issued for the purchase of the land. The first Mountain View Cemetery Board of Directors was made up of the following gentlemen: Dr. Samuel Merritt, Hiram Tubbs, W. H. Bovee, J. A. Emery, Rev. I. H. Brayton, William Faulkner, S. E. Alden, Rev. T. S. Wells, G. E. Grant, J. E. Whitcher, Major R. W. Kirkham, and Henry Robinson. In 1864 Rev. S. T. Wells was voted in as Mountain View Cemetery's 1st Superintendent, a position he held until 1870, at which time William Collins was elected the 2nd Cemetery Superintendent. General R. W. Kirkham was elected President of the Board of Trustees. The cemetery was dedicated on May 25, 1865, and the first person to be interred was June Weir in July, 1865. Over the next 11 years another 2,000 individuals were buried at Mountain View. Burials and interments still take place in Mountain View, and by 2002 there had been approximately 165,000 interments since the establishment of Mountain View Cemetery. In recent years, several new sections have been designed and opened, including Golden Lotus Mountain and Flowering Pear Garden. The cemetery association gives free tours twice a month focused on different aspects of Mountain View.